This reincarnation of Patagonia‘s early-’80s Summit Pack sports accessory patches to carry an ice axe, crampons or a foam pad for protection on a cold belay ledge. The Human Curve® shoulder straps stay out of the way of a harness and better conform to the shoulders and upper chest for more secure loading when you’re in terrain accessed only by other mountain goats. It has single-compartment simplicity with enough capacity to hold a sandwich, emergency rain gear and a good bottle of red wine. (For town use, it has a laptop sleeve.) Made of 8.4-oz 600-denier 100% recycled polyester, 200-denier polyester, and all treated with a polyurethane coating and a Deluge® DWR (durable water repellent) finish. 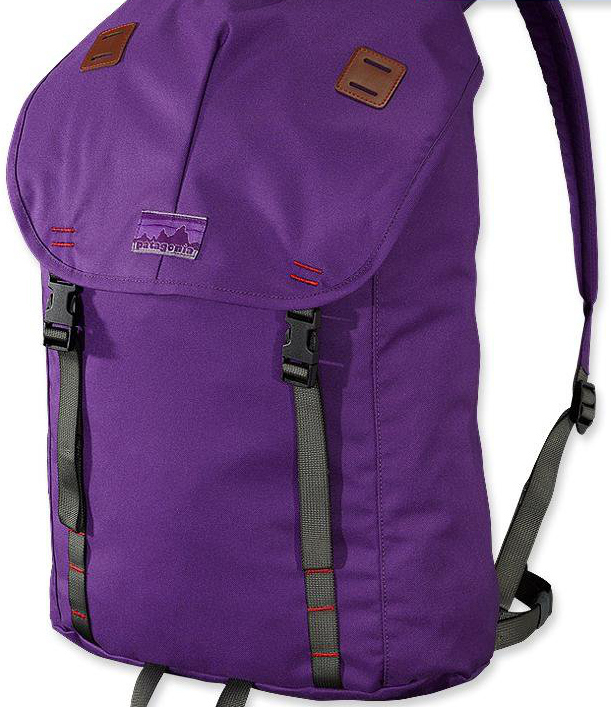 The Special Edition Summit Pack is an excellent idea, reinvented. -Generous main compartment; zippered stash pocket beneath flap. -Interior padded laptop sleeve, which is raised off the ground to protect contents, secures with a buckle closure and doubles as an insulated-hydration reservoir. -Human Curve® shoulder straps and an adjustable waist strap for ultimate carrying comfort. -Features a special edition 40th year anniversary Patagonia® label. -Body: 8.4-oz 600-denier 100% recycled polyester. Lining: 200-denier polyester. All treated with a polyurethane coating and a Deluge® DWR (durable water repellent) finish. Available online or at the Patagonia Toronto Store. BS 101 and the Tyranny of the Economy.